You can sponsor this leaf for yourself or as a unique gift for someone you know. As a thank-you, we will acknowledge your donation to the OneZoom charity by displaying your chosen sponsor’s name on Smiela mongolica. Your donations will help us in our aim to provide easy access to scientific knowledge about biodiversity and evolution, and raise awareness about the variety of life on earth together with the need to conserve it. There can be only one sponsor for each leaf, so get your favourite creature before someone else does! Sponsorship is for a fixed period of 4 years; after that, if you wish to renew your sponsorship, you will have the first refusal. Extra text will only show when fully zoomed in; it can be used for your location, or to say who it’s from if you are sponsoring as a gift for another person (e.g. Happy Birthday from John Smith). The extra text will appear on our main tree at OneZoom.org/life, but may not necessarily be shown on versions elsewhere. We will check that the sponsorship text is appropriate, and contact you if there is a problem. This is not intended to be advertising so please do not include web links. Normally your text should appear on the tree within a week. The minimum donation required for other leaves ranges from from £5 to £150 depending on popularity. If this leaf does not fit your budget consider our lists of animals and plants sorted by price to choose an alternative. *The final leaf may be facing in any direction on the tree, it may also change based on scientific advances. If you fancy something different, you can search for other available species, or simply browse the tree of life and see what you like. If we need to contact you about your donation or changes to your leaf, we will use the email entered here, otherwise we will use the email from your PayPal donation. We would love to be able to thank you by name: if this box is ticked we’ll add your name to our public list of donors. This is in addition to your sponsored leaf on the tree; we’ll only use the name above (and of course, we’ll never show your email). 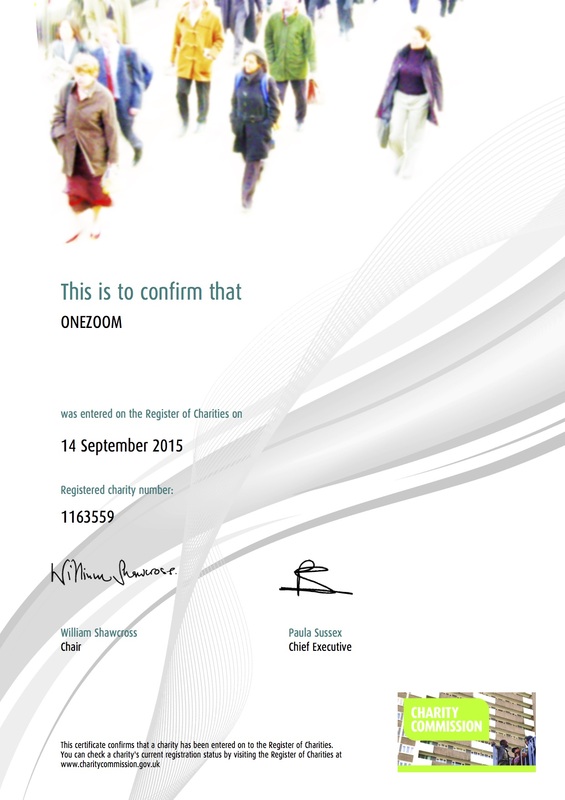 OneZoom is registered charity number 1163559 in the UK. Thank you for considering Gift Aid. Please share your street address by ticking the box when you make your donation through PayPal, this information is required for us to reclaim gift aid. Please also confirm that you agree to the below Gift Aid declaration. I am a UK taxpayer and understand that if I pay less Income Tax and/or Capital Gains Tax than the amount of Gift Aid claimed on all my donations in that tax year it is my responsibility to pay any difference. Please notify the charity if you want to cancel this declaration, change your name or home address, or if you no longer pay sufficient tax on your income and/or capital gains. If you pay Income Tax at the higher or additional rate and want to receive the additional tax relief due to you, you must include all your Gift Aid donations on your Self-Assessment tax return or ask HM Revenue and Customs to adjust your tax code. Please note: we will need your name, title and UK street address to process gift aid, so please fill in these fields above. Please also remember to instruct PayPal to share your postal address when making your payment - thank you. Accept terms and using PayPal.